If you follow my tweets, have me as a friend on Facebook, are part of the super secret society private group for crazy people writers on Facebook, or read this blog, then you are aware that I wrote a short story a while back based on the loss of someone close to me and submitted it for publication in an anthology that was being put together to help out a writer friend. The proceeds of this book are going to "Orange" Karen DeLabar and you can find her on Facebook, Twitter, and the Internets. This week, on April 11th to be exact, the anthology finally made its first public appearance and the response has been amazing. 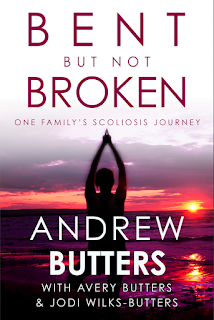 So many people, and not just friends and family either, have picked up the book - in some cases several copies. Readers Digest's Most Trustworthy writer, Margaret Atwood, even re-tweeted a link! It's hard to put into words what it feels like to be a part of something like this (but that won't stop me from trying). 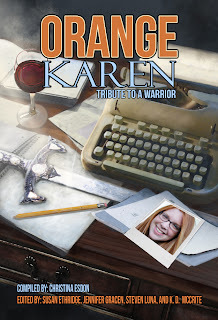 The Orange Karen Anthology represents my first publication, and that's a really big deal. 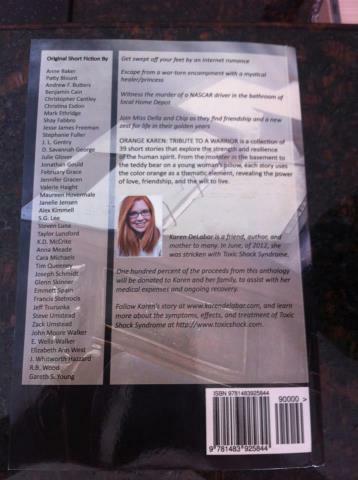 Seeing my name on the back cover of a book is a amazing feeling and one that's completely surreal. The story I wrote was one that was really close to me (write what you know, right?) and over the last couple weeks I have re-read it numerous times, read some of it out loud for R.B. Woods' "Word Count" podcast, and shared my story and the link to the book with hundreds of people: friends, family, co-workers, random strangers in the Twitterverse and Facebook, and the lady whose kid takes piano lessons at the same time as my kids' guitar lessons. Suffice it to say I'm a little emotional. One thing I have going for me is I know I'm not alone in what I'm feeling. Many of the other people involved have expressed how overwhelmingly emotional it is to be a part of this. Back in January I posted an open letter to writers. The catalyst for that post was largely due to personal experiences some of my writer friends were having at the time and the key takeaway was that to be a writer one of the things you need is a good support group. Based on what I've seen in the past few days it's clear that the people who put the anthology together, the contributing authors, and Karen herself have one of the most amazing support networks you could ever ask for. It's moments like these that convince me that there may be hope for humanity after all. This is the most round about, disjointed, gushy, thank you post you can imagine, but as I mentioned a minute ago I'm a little emotional, so cut me some slack. Knowing that Ryan's story is helping Karen have a happier ending to her story is what this is about, and I wanted to let as many people as possible know how much I appreciate it. I'm reading the anthology in its entirety now and I have to say there are some pretty amazing stories in there (mine is titled "Losing Vern"). If you haven't picked up a copy already I would highly recommend you do. *As a note, if you pick of a paper copy from the link above it results in the best royalty payment (that goes straight to Karen's medical bills). This is not a hard sell, just an FYI. If you pick up the eBook you still qualify for the group hug from the organizers and contributing authors. ^ If you own a Kobo and need the book for that format please contact me for a solution. I haven't had the chance to dig into my eBook of the Anthology yet, but I look forward to reading your story...as well as all the other ones. I'm so proud to be a part of such an amazing group of people. Proud is a good word. Having read a few of them already I can say that I don't feel worthy! Such a great group of writers. You won't feel like that when you read mine...ha! Total chic lit! Maybe that is why I haven't touched mine yet. I'm scared I'll feel inferior to everyone else. Proud, amazed, humbled... emotional... yeah, I feel all those things too. And Steph, mine is chic lit too! :) *ALL* of us belong in there.